Super star amateur golfer Curtis Luck has secured an early Christmas present with an invitation to compete in the ISPS HANDA World Super 6 Perth. Arguably Western Australia’s most successful golfer in 2016, Luck will tee it up in the ISPS HANDA PGA Tour of Australasia and European Tour co-sanctioned tournament when it is played at Lake Karrinyup Country Club from 16-19 February 2017. It has been a breakthrough year for Luck, who started his run of form winning the WA Open on the ISPS HANDA PGA Tour of Australasia before going on to win two of the world’s biggest amateur tournaments; the U.S. Amateur Championship and the Asia-Pacific Amateur Championship. Thanks to these two big wins, Luck has earned himself a place at Augusta National in April for the Masters Tournament but before he gets there he will take on the world’s best in his home town for the ISPS HANDA World Super 6 Perth. 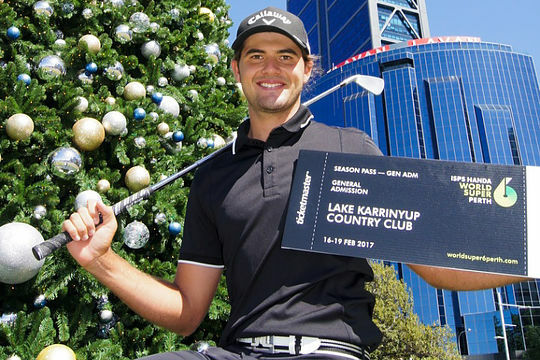 “I am pumped to have been given an invite into the ISPS HANDA World Super 6 Perth. Ever since the format was announced earlier in the year I had been hoping I would get the opportunity to play,” said Luck, who is the second highest ranked amateur golfer in the world. For Luck, who is on the path to becoming a professional, the ISPS HANDA World Super 6 Perth also offers a chance to extend his career opportunities. The winner of the combined stroke play and match play tournament will become fully exempt onto the European Tour until the end of the 2018 season. “I would love to win the ISPS HANDA World Super 6 Perth, not just so I am the first ever champion, but also so that when I do turn pro, I already have a card onto one of the biggest tours in the world,” added Luck. Luck will join World Number 8 Patrick Reed and World Number 9 Alex Noren at the ISPS HANDA World Super 6 Perth and if he makes it through to the match play on Sunday would be a fierce competitor having won his U.S. Amateur title following a 6&4 victory. The ISPS HANDA World Super 6 Perth will be played at Lake Karrinyup Country Club from 16-19 February and will form part of both the 2017 European Tour Race to Dubai and the ISPS HANDA PGA Tour of Australasia Order of Merit.